Shares of Great Bear Resources (TSX-V:GBR, OTC: GTBDF) are surging today after releasing drill results from the Hinge Zone and South Limb Zone at its 100% owned Dixie Project in the Red Lake District of Ontario. The market appears to be impressed by hole DHZ-014 (Hinge Zone) which included an intercept grading 190.78 g/t gold over 5.9 meters. (150 meters vertical depth) This section of DHZ-014 also included .7 meters grading an unbelievable 1602.73 g/t gold. Relative Strength and MACD on the daily chart are confirming the price breakout from the 3-month downtrend line. 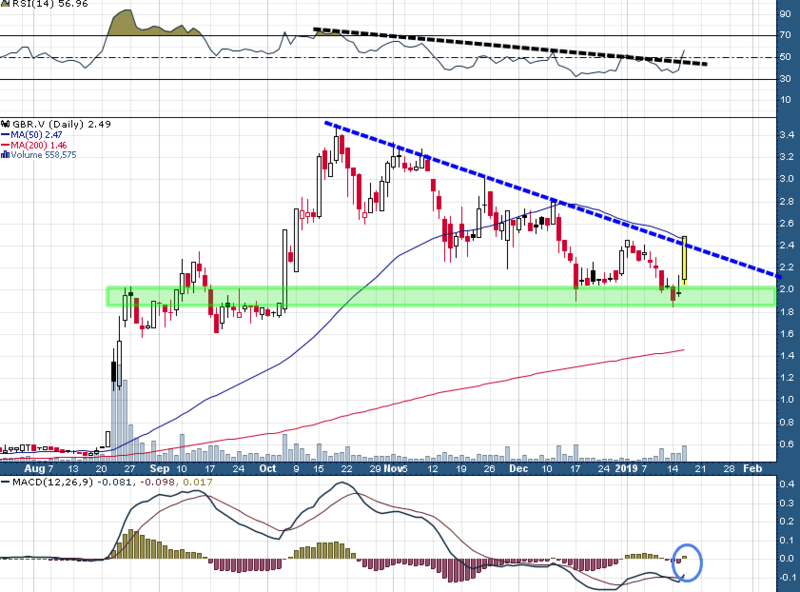 A daily close above C$2.50 would be highly significant with the next levels of resistance above near C$2.60 and C$3.00. GBR's technical team is getting a much better grasp on the structural controls at Dixie and I think the odds of seeing some more holes like DHZ-014 over the coming months is pretty good. Tomorrow's webinar is a must watch for shareholders and prospective shareholders to get a better understanding of what Great Bear is finding and looking for at Dixie. Disclosure: Author is long shares of Great Bear Resources and may buy or sell at any time without notice.